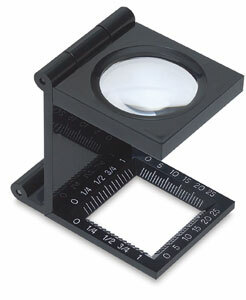 This magnifier loupe provides 5X magnification, with both inch and metric scales, yet it folds up and fits into a pocket or purse. Measure fabric count of canvas, or examine texture of a fine art paper. Perfect for hobbies such as stamps and coins, too.